KATIE: Waffles, that's not how it goes. WAFFLES: Holy Theme Song, Boss! Did I mess up the number of na-na's? KATIE: No, you've got the na-na's down. 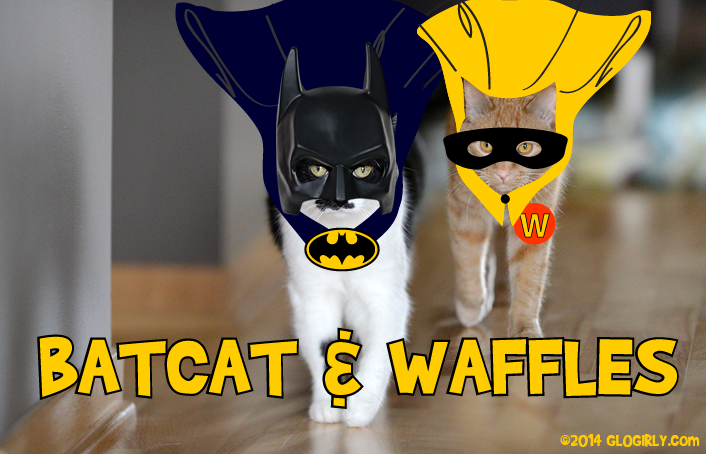 But the show is called BATCAT & Waffles. Not Waffles & Batcat. WAFFLES: Holy Breakfast, Boss! I think WAFFLES & Batcat is much better. KATIE: Holy Dyslexia, Waffles. Let's just get on with it, okay? 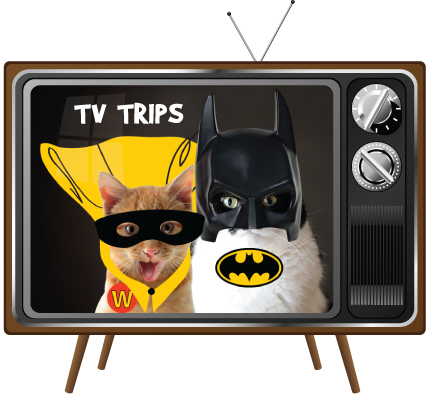 Join us each Saturday for another episode of TV Trips! Just tuning in? Catch up on all of our latest TV show spoofs. We've DVR'd them for you. 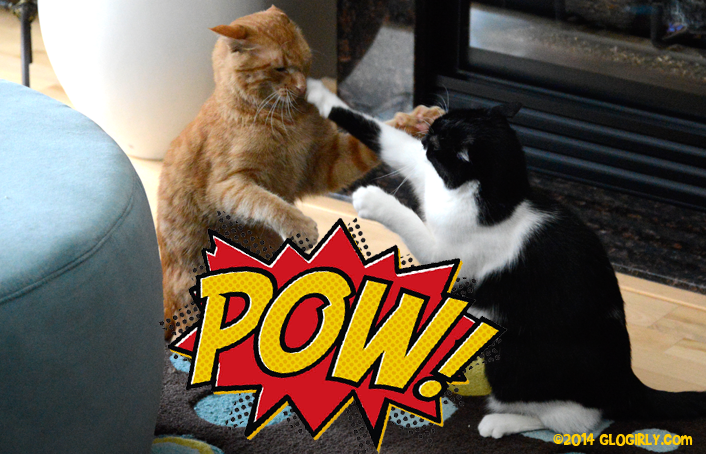 GLOGIRLY is proud to participate in the Caturday Art Blog Hop with our TV Trip Series. Visit HERE for more creative & clever cats. ...over not seeing Glogirly as Catwoman. Ok, ok, ok, already. Here she is. 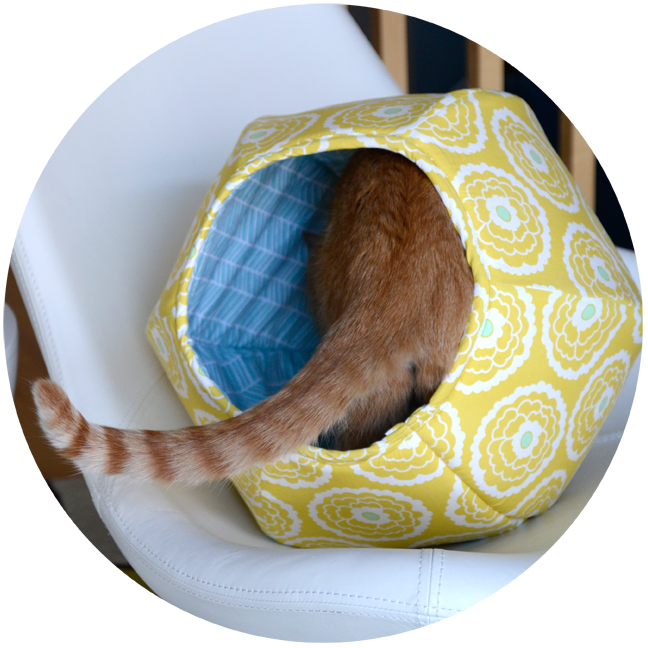 Don't miss this pawsome giveaway! This is the best one yet only Batcat is supposed to beat up the Joker and Riddler, not her sidekick. MOL! Now I now I now I now I now I now I now I now I now I now I now I now I HAVE AN EARWORM! We wanna see Glogirly as CATWOMAN! I was hoping for a GloMan cameo as Alfred. Niw Rags & Brat both want capes! My human's brother learned to read by watching Batman. Maybe I should set Binga in front of this blog post and she will learn how to write. MOL!!!!!!!!! Katie is a FANTASTIC Batcat!!!!! We LOVE the fight scenes!!! 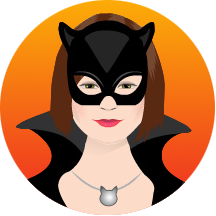 And yes, Glogirly NEEDS to be Catwoman!!! Meow this is grrrreat! Katie you make a wonderfur BatCat and Waffles... well you are Waffles after all. The Orangie Opposition to Evil. Great action shots kids! POW! That was great you two! Now go beat up some bad guys!!!!! Love this! Have a great weekend. MOL! Great job with this post! And thank goodness Catwoman made an appearance... now my day is complete! Purrs from Deb and the Zee and Zoey Gang! HAHAHAHA!!!!!! I loved this post!!!!!! So funny, I even brought my hubby and daughter out to the computer to read the post! Great super-cat costumes. But don't you need to save your whacks for the bad guy? Yay! My favorite comic. 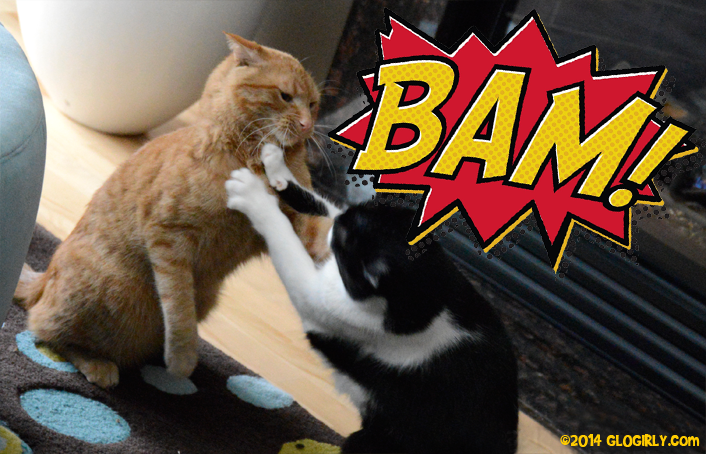 I think Batcat and Waffles were "practicing" their POWS so when it comes time to fight evil, they will be a well hones fighting team! Look at Batcat, mmmm, Katie does Adam West proud! And our little boy, he is growing up before our eyes! Off to fight villains! Ha ha - this is the best one yet. I'm so glad we hopped over from the Art blog hop this morning. You guys ROCK. CK got it right, they don't beat up each other! Great action shots, both. Love those outfits, too. The head peep is now singing "Na-na-na-na-na-na-na-na" to us and it's all your fault! What a fun post! Love the big POW special effects. Wow, they really are holy supercats! Hope that was all play whapping and no cats were injured in the making of this film...! Too funny and we love seeing Glogirly as Catwoman. THat was most excellent! Especially Glowgrly as Bat Woman! Batcat , na na na na na na BATCAAAT ! Holy Wagg kit nips guys this is my favourite. you guys look brilliant!! Faraday: OOH! OOH! You needz a Super-Villan! I'd be a PURRfect Deathstroke. Or RATcatcher! Allie: Pleease. More like the Joker or the Mad Hatter. Maxwell: *raises paw* Uh, I could be Q. International Box Day... or Box-ING Day? Clean Carpets, Wet Paws & Horses??? Will Waffles EVER Get to Pettie Katie??? National Cat Enquirer Exclusive: CAUGHT! Happy Birthday to ARE YOU KIDDING?? ?